Perhaps you heard, Apple is having a little press conference on Friday. The reason? Officially, it’s about the iPhone 4. That’s all they’ll say. But everyone knows the slightly more detailed reason: the iPhone 4’s antenna. The only details Apple is giving out about the event is that it’s going to take place on their campus on Friday morning at 10 AM PT. But talking to some other people who got calls from Apple as well about the event may hold some clues as to what we can expect. First and foremost, the whole thing is bizarre. Apple has announced events with very little notification before, but never this little notification. The event is Friday morning and they notified people on Wednesday evening (or night for those people on the east coast). This essentially gives people one day notice. And they’re calling people across the U.S. about it, and asking if they can make it. For some, this means last-minute cross country flights. Obviously, Apple isn’t going to be paying for those, so it’s not clear how many people from outside the Bay Area are going to attend. And many are unsure if they should attend because Apple is being so vague about what they’ll be talking about. But you have to imagine if it’s a last-second press conference, it has to be pretty major, right? Not necessarily. My sense is that the main idea behind this event is to get a bunch of big publications and other key Apple influencers into a room to go over the iPhone 4 antenna issue once and for all. I have little doubt that Apple CEO Steve Jobs himself will be leading this discussion, with other Apple executives talking as well. I also suspect we may see some antenna and wireless industry experts to offer their insights as well. The purpose of such a gathering would be to cut off the backlash against the iPhone 4 at the knees. The Consumer Reports flip-flop would seem to be the major catalyst here. And regardless of what you think of Consumer Reports, Apple knows that it is a brand many average consumers trust. In fact, Apple has had no problem citing it before when they rate the iPhone favorably (incidentally, the iPhone 4 is Consumer Reports’ highest-rated smartphone, despite the non-recommendation). Still, the Consumer Reports story is just one thing. More troubling to Apple has to be the cascade effect it has had on the media. CNN is talking about it, MSNBC is talking about it, local news is talking about it — even David Letterman is talking about it. The situation has gotten out of control in a way the tightly-controlled Apple cannot find comfortable at all. So that’s what I believe this event is about. A way to pivot the message back to what Apple perceives to be the facts. Apple will undoubtedly acknowledge that holding the iPhone 4 does affect the signal. But they’ll note once again that this is true of all cellphones. And perhaps some experts will chime in to show some results to prove this to be the case. They’ll also undoubtedly point out how the iPhone 4 actually has the best antenna Apple has ever produced. They’ll probably have results to back this up as well. The focus will be on the facts that Apple has studies to prove. And the idea behind all of this is to drill it into our heads that the antenna issue is being blown out of proportion. That it’s an easy headline about a hot product. And Apple’s tactic may just work. Because it’s a lot harder to blindly write about one side of a topic when the other side has very directly addressed and refuted the issues with you. Apple will also likely talk about the software fix that is currently testing (iOS 4.1) which they say will help the issue as well. Our early tests show iOS 4.1 doesn’t fix the antenna issue at all (it is, after all, a hardware issue). But it does alter the bar indicators to make them more accurately reflect your actual signal, which is what Apple said it would do. Earlier tonight, a MacRumors forum poster laid out a similar scenario about how this event may play out. The difference is that he believes Apple will give out $50 gift cards that iPhone 4 purchasers can use to buy iPhone bumpers (cases) if they wish. I’m not sure how likely that is. But I wouldn’t be surprised if Apple does announce a way to specifically give away these bumpers (which are normally $29) to people who buy (or have bought) the iPhone 4. Another thing the forum post didn’t really hit on was the importance of who is invited to this event. As I said, Apple seems to be focusing on key influencers in the tech media. My belief is that Apple is hoping that by aiming at the top, the message will trickle down and overwhelm the Consumer Reports fall-out. Again, whether you agree with it or not, it seems like a pretty good strategy. Of course, all of that is just speculation. With this little amount of time before the event, it’s unlikely that anything will leak out before it happens. But there is always the possibility of one giant curveball. While I still find it hard to believe that Apple is thinking about an iPhone 4 recall at this point, the possibility is interesting for this Friday event. After all, it makes more sense to issue a recall in a controlled manner (where journalists can digest the news and ask questions), rather than to issue a statement about it and have everyone scream bloody murder. Again, I don’t think that is going to happen, but it’s not entirely out of the realm of possibility if say, Apple is willing to acknowledge that there are at least some defective iPhone 4 antennas. The thing that’s a bit curious about this press conference is that Apple has already set a precedent by issuing a statement about the antenna issue on July 2. If they’re now doing a full press conference, surely their announcement must be more significant, right? But again, that statement was before Consumer Reports changed its mind and decided you shouldn’t buy the iPhone 4 due to the antenna issue. And that report has led us to where we are now. 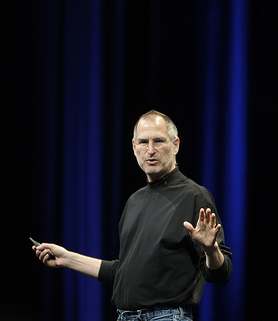 To combat that, Apple may feel the time is right to pull out their not-so-secret weapon: Steve Jobs. On a stage. Talking.